Ah well, you knew I couldn't keep up the real-time updates on the blog. So let's go back to the day before I left for vacation. 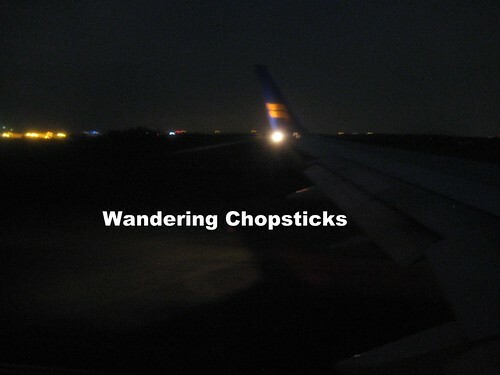 I had a 5-hour flight to Washington, D.C., then several hours layover, and a 5 1/2-hour flight to my destination. Could you believe neither of those flights had free meal service? 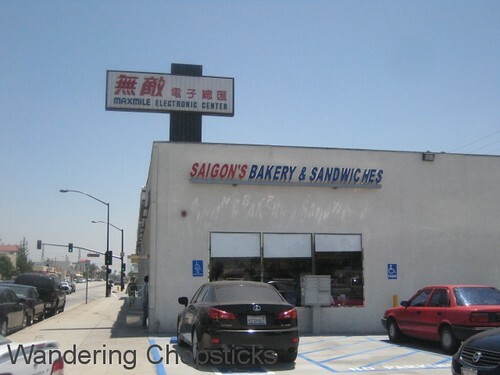 So in between trying to get my house in order, I managed to run to Saigon's Bakery and Sandwiches in San Gabriel to grab some Vietnamese sandwiches for the road. 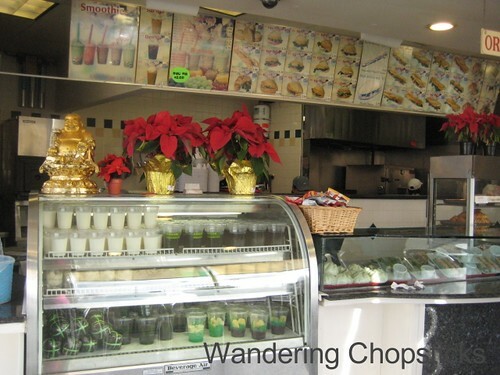 This location is by the San Gabriel Superstore, so it's a convenient stop-in after grocery shopping. 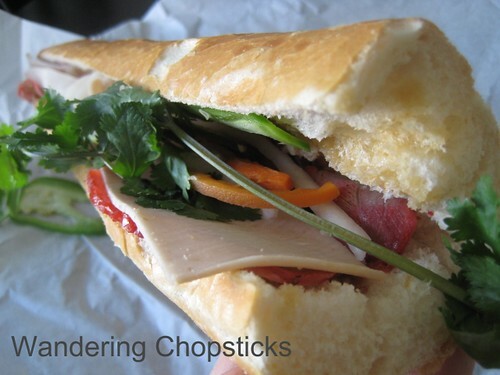 I've been going to Saigon's Bakery and Sandwiches for years now, and have to say it's my favorite Vietnamese French bread, light, airy and crispy. It also has the best Banh Mi Xiu Mai (Vietnamese Meatball Sandwich), seasoned and flavorful, not just steamed like at other places. The sandwiches also wear well for travel. The bread doesn't get hard and dry and the filling isn't all fatty, absolute musts when I buy them a day in advance before a flight. Freshly toasted, I'm still partial to Banh Mi & Che Cali Restaurant - Alhambra's crunchy soft bread and the pate they use just does it for me. But for price point, Saigon's Bakery and Sandwiches is actually cheaper now. Banh Mi Che Cali charges tax, Saigon's Bakery already has the tax in the price. So it's a few cents cheaper, but hey, those pennies add up. 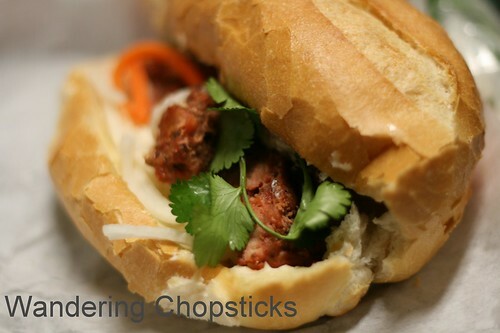 The Vietnamese French bread sandwiches here are $2.25 each (The baguette sandwiches are $2.75 each. ), and they're buy 2, get 1 free. They used to be buy 3, get 1 free baguette, and buy 6, get a free sandwich. But this summer, they lowered their price point to many a happy customer, namely me! Pictures are from previous visits. 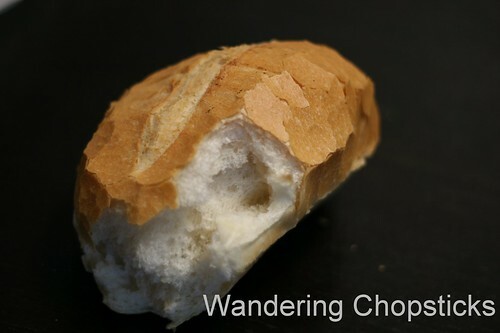 The Vietnamese French bread here are rounder and shorter than other places. This is the banh mi dac biet (Vietnamese special sandwich) with Xa Xiu (Chinese Barbecued Pork) belly, cha lua (Vietnamese steamed pork loaf), Pate (Faux Gras with Chicken Livers), Do Chua (Vietnamese Pickled Stuff ie. Carrots and Daikon), and jalapeno slices. Close-up of the filling. 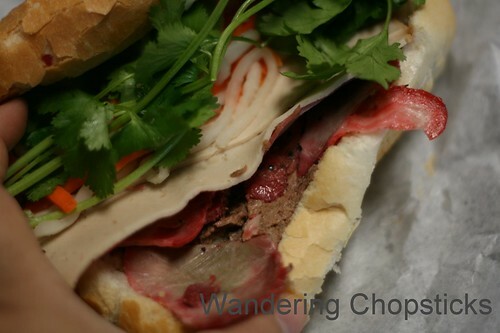 The other thing I like at Saigon's Bakery is that they still include cilantro in the sandwiches. A lot of places have been leaving the cilantro out these days. The meatball sandwich with all the usual fillings. 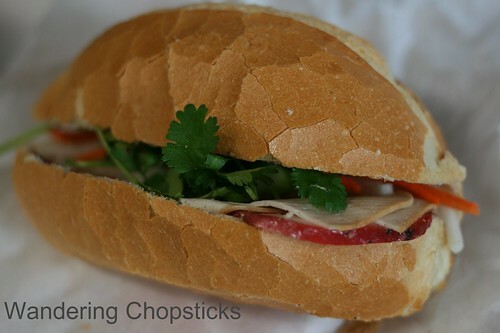 The plain Vietnamese French bread rolls are three for $1. After being up literally all night cleaning house and packing, I conked out on the flight east. 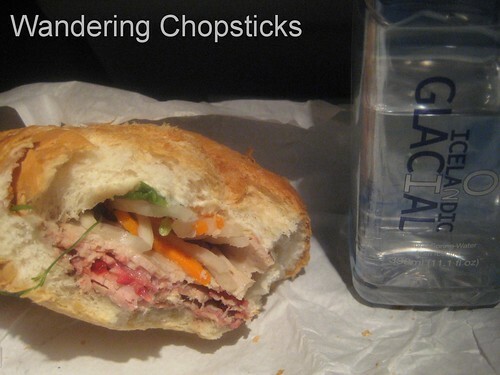 I finally got to enjoy my banh mi on my flight from Washington, D.C. to Iceland. Even digging in a full day after I bought it, the banh mi was still good. Did you correctly guess that's where I was headed? I used my United frequent flier miles to visit my cousins is Oslo, Norway, but only had enough miles for the flight home. The cost to buy the rest of the miles to make it a round-trip ticket was actually more expensive than a one-way ticket from LAX to Oslo on American Airlines via Icelandair. FYI: in case you didn't know, the cool thing with Icelandair is that you can layover in Reykjavik for up to a week for free. 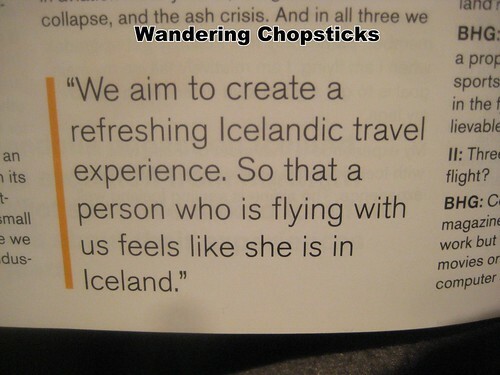 I've always wanted to visit Iceland so this option became the obvious choice. The only downside is that Icelandair doesn't have free meals, even on international flights. Boo! The other cool thing was while reading the in-flight magazine, Icelandair Info summer 2012 edition, the Icelandair CEO Birkir Holm Gudnason was interviewed on his 12 years with the airline. The quote wasn't as important as the fact that the default pronoun was the feminine. Whoot! Grammar nerds rejoice! 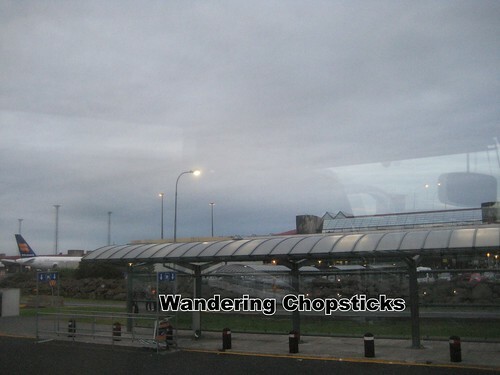 The flight went much quicker than I expected and I arrived at Keflavik airport at 6 a.m. I pre-booked a shuttle to my hotel in Reykjavik and in my eagerness to get on my way, the guy at the shuttle desk even had to tell me to calm down, I was on vacation. Vacation! I thought I gave myself three days in Iceland, but forgot I lost a day of travel. Doh! Blonde moment. I kept looking at the confirmation itinerary and seeing the day I left, ignoring the +1. So I had to squeeze everything I wanted to do in two days now! Nonetheless, I couldn't wait to explore Iceland! 2 years ago today, Mapo Tofu Ramen. 3 years ago today, Chichen Itza Restaurant - Los Angeles. 4 years ago today, How to Eat a Jackfruit. 5 years ago today, on Sundays... I still watch out for and give my cans to the little old Chinese man who digs through the recycling bins. So nice to have good travel food options when international flights don't even have free meals. Looking forward to more on your trip. That's a pretty good deal. Oh, I would love to have that for lunch or dinner any day of the week. Down here in San Diego, it's $3.50 a piece and the meat is too fatty. You have to eat it right away, if not the bread becomes hard and the meat is not as good any more. There are not many stores down here, so they can name the price and no competition. Bad for customers, me - of course! I've been going here now to get banh mi for my parents to eat during their flights up to Portland. 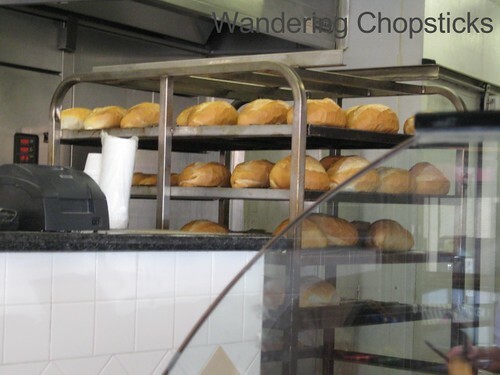 Tried various other bakeries, but the bread gets too stale for my parents to eat. When we were in San Diego for my sister's graduation, we arrived around lunch time and I asked her to get some banh mi for my parents and aunt and uncle. She didn't know of any place nearby or for the same price. Eventually she ended up paying about that much at a pho restaurant. But when she asked if she could get bagel sandwiches instead, I said the adults definitely wouldn't have wanted that.